Not so long ago, professional success meant decades of dedication to a single company, culminating with the ultimate symbol of a distinguished career – a gold watch. Today, it has become common for people to switch jobs more frequently over the course of their career. In fact, on average, people change companies approximately every five years. As changing companies is common among today’s professionals, shifting careers from one industry to another is also happening more frequently. The portability of professional skills from industry to industry means that people now have more options to switch industries without having to restart their careers from square one. Switching industries might sound like a daunting task, but millions of LinkedIn members made the leap in 2014. 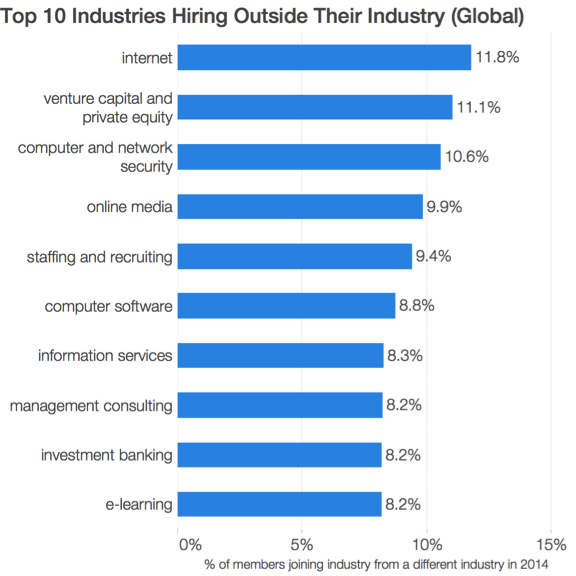 If you’re looking to transition into an entirely new industry, we’ve conducted research to help inform your decision by compiling the industries on LinkedIn that are hiring a high percentage of people from different industries. The Internet industry is comprised of much more than just people with technical backgrounds. While an integral part of any Internet company is recruiting top engineering talent, our data shows an influx of brand specialists arriving from Retail and business development/strategy professionals arriving from Management Consulting. E-learning is emerging at the intersection of education and technology. Nearly as many members entering this industry arrived from the Education Management industry as from Information Technology. Common roles include content developers and partnership managers. An influx of venture funding, such as the $186 million round for Lynda.com earlier this month, is helping to fuel this momentum. Venture Capital is not just for ex-bankers. New industry entrants are coming from nearly every industry - from Food & Beverages to Financial Services. VCs need a diverse set of experts to properly source and evaluate new opportunities, as well as manage current investments through mentor, advisor, and board positions. Online Media is absorbing talent from traditional industries such as Publishing, Newspapers, and Broadcast Media at a fast clip. Writers, editors, and creative directors are flocking to these energized organizations. Look for these industries to continue to drive growth in 2015. If you’re seeking a role change, expand your search to these industries to find new and exciting opportunities. As we continue to develop the Economic Graph, a digital representation of the global economy, we hope to empower our members by helping them make better career decisions and achieve economic opportunity – whether it’s finding new options in their current fields, starting a freelance business, or inspiring a switch to new industries. We looked at all members who added a new position to their LinkedIn profile within the past year (January 1 to December 31, 2014) that was at a different company than the one prior, excluding internships and volunteer roles. We then identified the subset of members whose new company operates in a different industry from their previous company. Finally, we calculated the number of members joining the industry in 2014 as a percentage of the total members who worked in the industry as of December 31, 2014. Only industries with over 50k global members were included.